Posted October 5th, 2011 by Codastar & filed under Codastar News. In a post on the Google Analytics blog last week, John Jersin from the Google team announced the real time changes and began by explaining just how fast the web moves nowadays. Jersin explained that instead of waiting for problems to arise or making tweaks and changes to our websites every few weeks, we now need to be constantly monitoring what’s happening and on the look out for anything that needs to be addressed, from a tweet that no one’s clicking on, through to big problems with the build of your website. 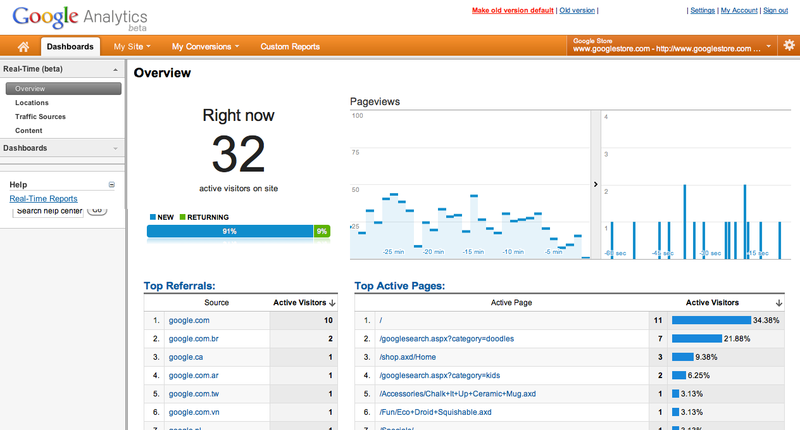 At the moment it can take hours for important data about your website to appear on the main Google Analytics dashboard. However, with the introduction of real time statistics last week you can now view things as they happen, which is a huge improvement! Jersin points out that one of the biggest opportunities with this kind of real time monitoring is to see what impact social media has on your website traffic. So, you can see how well a certain tweet is doing, how many people click on the link and when they stop engaging, which tells you all kinds of things, such as which content is most compelling and when you need to start conversation with your community again. These kinds of instant results that show up straight away on your Google Analytics dashboard also make sure you’re never caught off guard, so you can check all of the data is being sent through and collected correctly before you start an important campaign. To access real time reports you need to make sure you have the newest version of Google Analytics. To do this, sign into your Google Analytics account and look at your email address at the top, if there’s a link which says “new version” next to it, click that to make sure all of your tools are as up to date as possible. You should then see the real time reports in the “home” section, but this will take a few weeks to roll out to all current users, so keep an eye out for this new feature. If you don’t use Google Analytics at the moment and want to understand how to gain a better insight into who visits your website, then get in touch with one of the Codastar team today and we can explain the dashboard to you and install the necessary pieces of code onto your website to start tracking your visitors.